Are you looking for an alternative to those BORING classes that your friends warned you about? Look no further! 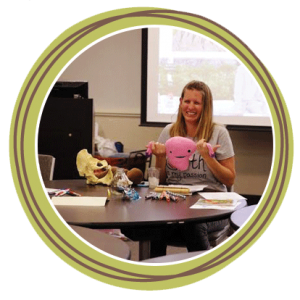 My classes are comprehensive AND interactive – I use games, short videos, partner activities, and group discussion to help you get the most out of your experience. You'll receive handouts with evidence-based website & book recommendations to get more information on what we covered in class that day, and some classes include a workbook and/or a DVD. My mission is to help you build your confidence as you approach this new chapter in your life - and to have a FUN time doing it! Please let me know if you have any questions about my classes or if there’s anything else you’d like me to offer! I look forward to being a part of your journey into parenthood!